This week in our 20 Days Challenge to Better VC Projects, we’ve been talking about how to scale your own projects. Another way to scale projects is to collaborate school-to-school, with multiple teachers from each school connecting with each other. It is very rare to advertise for a partner school and actually get a response. Most people aren’t willing to commit to multiple collaborations with an unknown partner. It’s better to build on a collaborative relationship and expand it further. Think about your Read Around the Planet partners from the last few years. Would you like to work with any of them further? Think about your other collaborations that you have done. Are there any partners who were easy to work with? If your location has participated in the Jazz Workshop, other participants make great partners too. If you haven’t done enough collaborations yet, then start building your network of potential partners by responding to collaborations on CAPspace and CILC; participating in Read Around the Planet, and following other videoconference coordinators on Twitter. 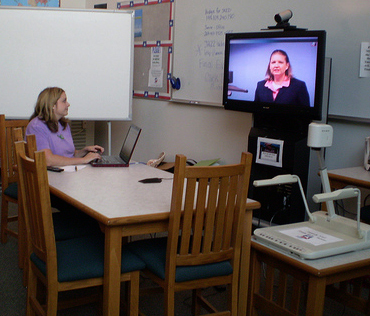 After you find someone willing to work with you, plan a videoconference with them. Bring your schedules and compare them. Bring a list of interested teachers. One of my coordinators has done this successfully, and walked away from the planning time with 10 videoconferences scheduled! Less test calls! If you test once and know how to connect; you can have multiple connections without doing additional test calls. More in depth collaboration. Often school to school collaborations expand to each pair of teachers connecting multiple times during the school year. It’s very difficult to get a “cold” / new partner to commit to multiple VCs from the start of the relationship. With school to school, this collaboration can evolve over time. Long term relationships lead to more collaborations. As you get to know each other further; and compare curriculum and interests, you’ll think of even more collaborative VCs that your classes can do together. Please comment! Have you done any school to school collaborations? What made it work? What made it challenging? Don’t forget! Kid2Kid Videoconference Connections, a six week online course starts Monday January 25. We can still get you registered if you want to join! This entry was posted in Collaborations and tagged betterVCProjects2010. Bookmark the permalink.